Never let it be said that I don’t cover all topics here on Joli House! Allow me to introduce you to The Table. Now before you tune out in a “wtf – has she finally actually gone mad?! ?” moment, just let me explain. We are going more lifestyle-y ’round these parts too, remember! This table is almost the same age as me. A youngster by furniture standards, but you’d never guess to look at it. Let’s just say it’s well used. My mum and dad bought it just after I was born and, as have all good dining tables, it’s hosted many a civil and uncivilised dinner. For quite some time now, my mum has asked people passing through to carve their names into the table and many have obliged. Friends young and old have left a permanent reminder of their visit(s) and you know what? I love it. It’s not odd to me at all! Some have looked bemused when presented with a sharp tool for carving but all have embraced the quirkiness of both my mother and this table. No shortage of quirkiness in this house, put it that way! It’s a record of the people who have (at some point in time) been welcomed into my home. Some are no longer part of our lives, by choice or otherwise. Some will no doubt return to carve again. No doubts that The Table itself ain’t going anywhere any time soon though! Quirky table does seem to bring out the crazy in folks too! Two have actually managed to miss-spell their own names would you believe. Whilst stone cold sober too. Some choose to leave a light impression whilst others positively gouge their name out. Some use tiny lettering and some a very deliberate 2 inch blocky font. If nothing else, The Table is its own little social experiment. Could read all manner of personality traits into the markings people leave! I can’t see my mum (or me) tiring of this little project any time soon. We don’t expect everyone to ‘get’ our table weirdness but I think most will tolerate it. Come add your name soon yeah? Great post! I love this idea, I think I might even do it myself one day when I have my own dinning table. Oh wow what a beautiful thing! That’s a table you will cherish until you grow old–can you imagine how many names will be carved into this table by then? This might become some tiny piece of art by itself! Now I feel stupid with my signed cork wine jar haha! A signed cork wine jar sounds adorable! I’m sure corks are much easier to sign than a table haha. I can’t wait to see what it looks like in years to come with a whole load more names! 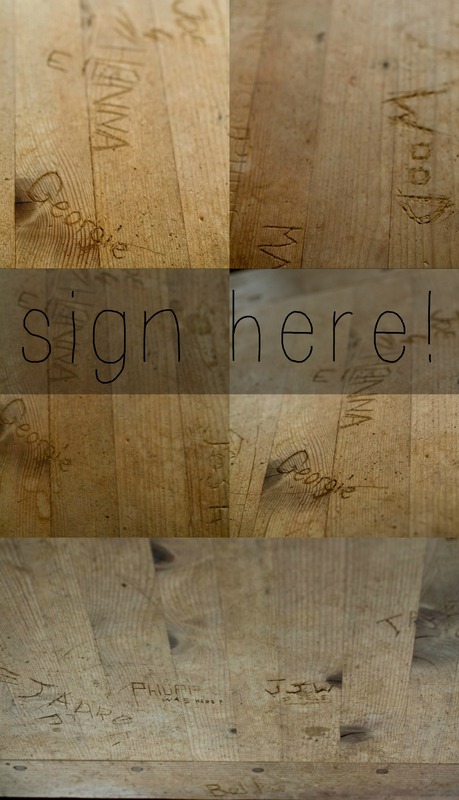 What a great idea, it’s like in the olden days when people would sign the bathroom window! I’ve not known anyone else to have a carved dining table haha 😀 A thrifted table would be perfect for it! What a beautiful idea! It would be nice to pore over the names. They are probably a good way to feel like you are a part of all these friends while you are sitting around enjoying some food or a cup of tea, even if you are on your own at that moment.